Personally, I think a more fitting headline would have been "Conservative in-action wastes £60k+ of tax-payers money". I wrote to Derrick Murphy as Leader of Norfolk County Council in 2011. I warned that Charles Burrell would be closing as a school and that this would be a huge loss for the local community and would inevitably cost the County Council money if it did not act. Despite that warning, that's pretty much precisely what happeed! 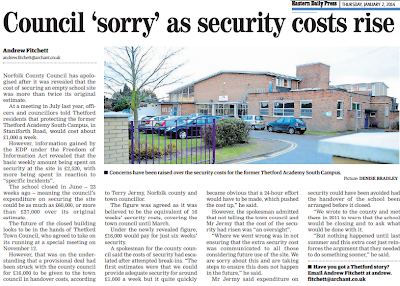 The site ceased operation as a school around July 2013 and the Council had to engage a security firm to keep the site safe. The cost does seem incredibly high - but then whatever the bill is / was - this could have been entirely avoided with more proactive thinking on behalf of the Council. 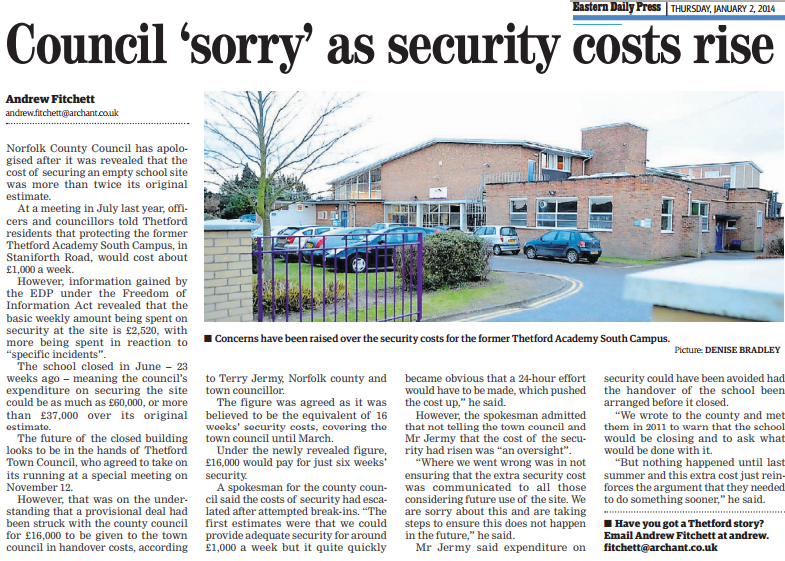 Let's hope there will be no security costs being incurred very soon when the site is transferred to Thetford Town Council and it becomes a vibrant community hub.